The exhibition Uraniborg offers a unique foray into space and time, two themes that lie at the heart of Laurent Grasso’s approach. The history of observation and its connection to political power also plays a pivotal role in his work and acts as a starting point for a broader examination of seeing, controlling and monitoring, at the same time as it opens up a path to possible worlds. For this presentation, the artist has created a device that alters the architecture of the venue in order to probe the modalities of perception. The device refers to the architecture of the Uraniborg, the last observatory built to perform measurements with the naked eye. 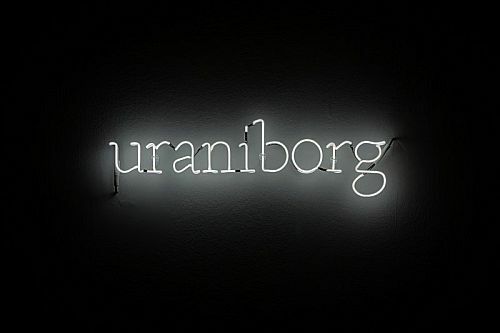 Grasso’s latest film work, Uraniborg, 2012, which is part of the exhibition, also takes its title from this unique place. Uraniborg, or “Castle of Urania,” the Muse of Astronomy, was the name given to Danish astronomer Tycho Brahe’s castle and observatory erected on the island of Hven in 1576. Financed by King Frederick II of Denmark, the Uraniborg was at the time considered the most important observatory in Europe. Practically no trace remains of it today, however, as it was destroyed by island residents after the scientist was forced to leave Hven in 1597. Conceived as a artwork in itself, Uraniborg transforms the museum’s exhibition galleries in a way that echoes the panoptic constructions studied by Foucault and destabilizes viewers by blurring their spatial and temporal points of reference. In this imposing labyrinthine architecture, visitors are drawn into a long corridor broken up by windows offering a glimpse of videos, paintings, drawings, neon works, sculptures and artifacts of history and mythology. This distinctive layout creates parallel worlds and experiential spaces, leading viewers to continually readjust their positions and their benchmarks with respect to the works they are looking at. The artist explains: “The idea is to construct a floating viewpoint, thereby producing a discrepancy in relation to reality. We move from one space to another, and that’s also how we create states of consciousness.” In this way, Grasso devises dizzying architectures which prompt us, as we experience them, to ponder the panoptic strategies of power.